Verna M. Forslund, 81, of Green Bay, departed this life peacefully at home on Friday, November 30, 2018. Verna was born on August 12, 1937, in Grand Chute, WI, daughter of the late Frederick and Rose (Spietz) Lecker. She took great pride in her skills as a bridal seamstress. 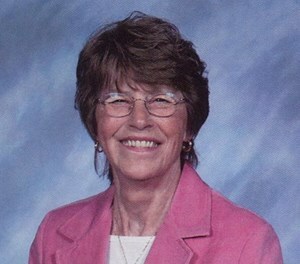 Verna was a woman of strong faith and an active member of Redeemer Lutheran Church for many years. She married the late Clarence "Tintcy" Forslund on August 9, 1958, and together raised their four children. She and Tintcy performed as part of the Tintcy Trio. She was a loyal Packer fan. Verna will be remembered for her attention to detail and hard work ethic. Verna is survived by four children: Dan (Julie) Forslund, Lorraine (David) Doell, Linda (Lance) Hoffman, and Debbie (Gary) Vought. She also leaves a sister, Elaine Moeller and a brother, Richard (Ginny) Lecker, along with sisters-in-law: Karen, Bonnie, and Olive Lecker. Verna leaves seven beloved grandchildren: Luke, Logan, Bekah, Nathan, Levi, Andrew, and Laura, along with numerous nieces, nephews, extended family and friends. Verna is preceded in death by five brothers: Earl, Don, Fred, Roy, and Rollie, and a brother-in-law, Orlo Moeller. 210 S. Oneida Street, Green Bay. A service celebrating Verna's life and faith will follow at 6 PM in the church. Interment will be in Fort Howard Memorial Park. Newcomer - Green Bay Chapel has been entrusted with arrangements. To share a memory of Verna or leave a special message for her family, please click the Share Memories button above. Add your memories to the guest book of Verna Forslund.